Every family has its secrets. So does every nation. But Turkey’s official secret remains extraordinarily potent because public references to the massive event that occurred 93 years ago are forbidden. 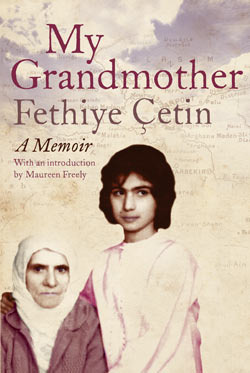 Fethiye Çetin's memoir of her grandmother is at one level a simple affair: a warm and vivid portrait of a person with whom she enjoyed a close bond. So close in fact, that it was only to Çetin that grandmother Seher could begin to tell her true story. That her name was not Seher but Heranu, that she was born a Christian not a Muslim; that most of the male members of her family were massacred in 1915 while she and other female relatives were sent on a ‘death march’. In other words, though these words are never used, that she was a victim of Turkey's genocide against its own Armenian population. She was saved – after a fashion – by being ripped from her mother's arms by a Turkish gendarme who adopted her. The author's acute sensibility and ear for detail set this account apart. Her own conflicting feelings – towards her country, her ancestors – as she discovers the truth, provide another layer of emotional complexity. Çetin is not alone. An estimated two million Turks have a grandparent of Armenian extraction. Since 'coming out' about her grandmother's true identity – at the old woman's funeral – the author has been contacted by many others with similar stories. As the human rights lawyer who represented Hrank Dink, a prominent Turkish-Armenian journalist assassinated by ultra-nationalists last year, Çetin knows the risks. Two brave voices ring throughout this book: hers and her grandmother’s. Their message: the damage cannot be undone, but silence only deepens suffering.